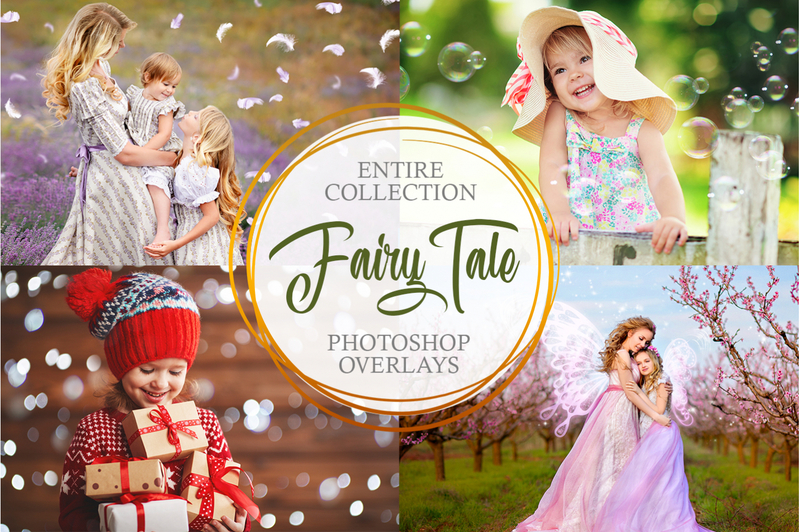 Download these wings overlays for Photoshop and apply them to the photo - turn your ordinary baby or family summer photos into the fairytale and even magical pictures within no more than a few minutes. The pictures will be very tender, sweet and beautiful. 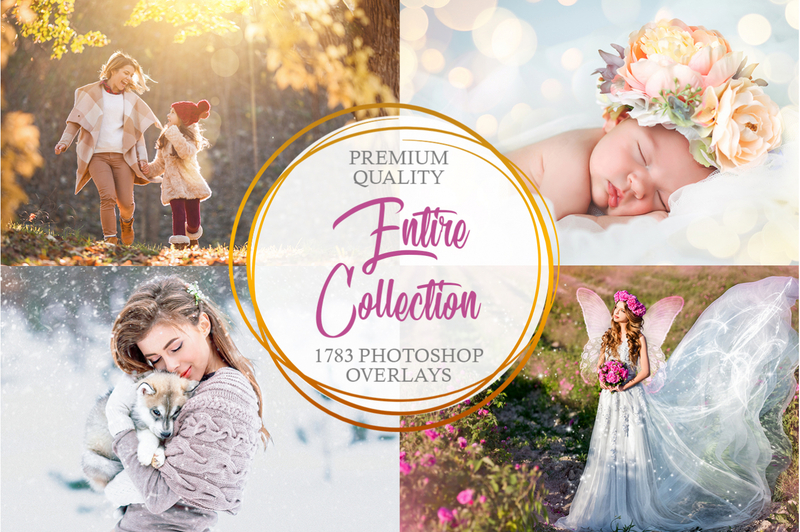 In this set, we provide you with 10 free professional overlays with wings of a butterfly, a fairy, an angel, and a bird. All of them are realistic, of different shapes and sizes. These wings overlays Photoshop are easy to edit and move around the photo so that you can create the perfect image without any effort. PS Overlay #1 "Like a Fairy"
PS Overlay #3 "Like a Butterfly"
PS Overlay #5 "Blinding White"
PS Overlay #6 "Little Elf"
PS Overlay #7 "Feathery and Light"
PS Overlay #8 "Like a Moth"
Becoming a fairy is one of the biggest dreams of almost every little girl. The main reason children like fairies so much is because they have wings. 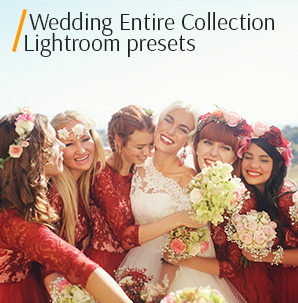 Adding such elements as wings most photographers consider to be a laborious process. Very frequently photo retouchers have to spend hours drawing digital wings on the photo. Thankfully, with the wings overlays for Photoshop by FixThePhoto, this procedure stopped being so exhausting and time-consuming. 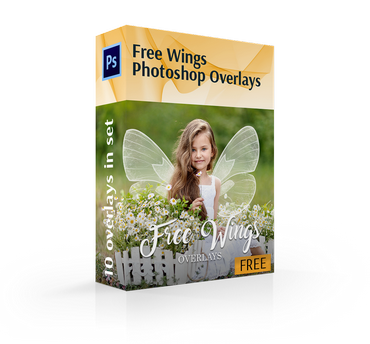 You can easily download and install our wings overlays Photoshop free, within one click. 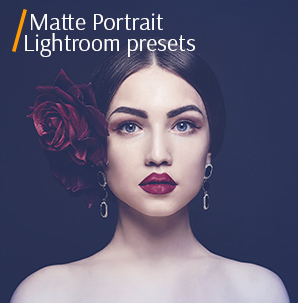 The overlays will assist you in achieving the desired effect. 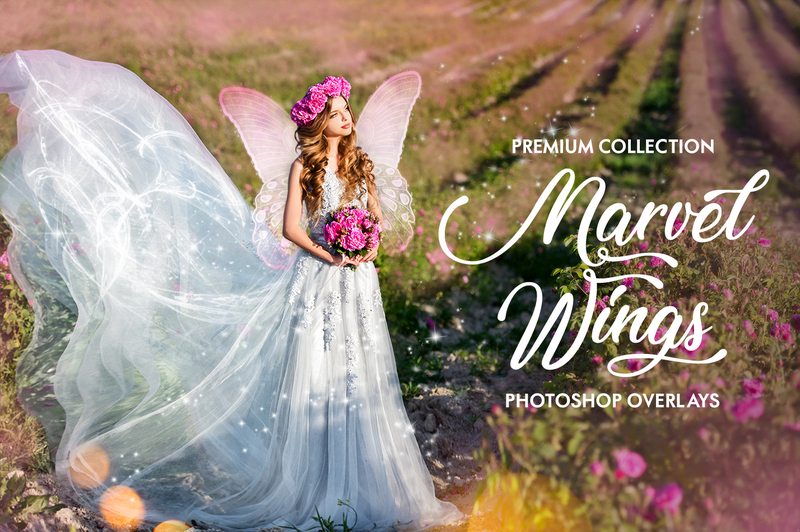 This set offers a great selection of high-quality wings overlays for Photoshop that will turn your photo into a scene from a fairytale. Download any fairy wings overlay and transform models from your photos into flying creatures, the result will definitely leave people speechless. Try them out right now and be ready to fly away into a magical world. Free Wing Overlay Photoshop #1 "Like a Fairy"
Select the look of the model in the photo carefully. 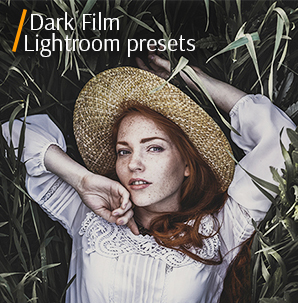 An ordinary shot will look out of place with this effect. This overlay #1 was taken from "Marvel Wings"
With this overlay wings, any model can be turned into a fairy in the photo. The white wings are attached to the back of the model for a more natural effect. Free Fairy Wing Overlay #2 "Delicate"
This wings overlay will look great in a photo where the model is not focused on the process of shooting and performs some action or is in motion. This overlay #2 was taken from "Marvel Wings"
This wings Photoshop overlay is absolutely perfect for an image of a dreamy newborn child. The overlay adds transparent butterfly wings with an intricate wing pattern. Wings Overlay #3 "Like a Butterfly"
This wing overlay is suitable for photos taken in the forest or on the green lawn. This overlay #3 was taken from "Marvel Wings"
Any model, especially a small girl, will look incredible in an image when you apply this wings overlay Photoshop. The addition of outspread butterfly wings will surely make a child portrait more remarkable. Free Photoshop Wing Overlay #4 "Translucent"
Don't be afraid to use wings overlays Photoshop not only for images with children but also for female portraits if the look requires it. This overlay #4 was taken from "Marvel Wings"
This wing overlay Photoshop is fitting for those portraits where the model stands straight and looks directly into the camera. With the help of this overlay, you can apply broad and detailed butterfly wings to a picture for a fantastic effect. Overlay Wings #5 "Blinding White"
This overlay wings will look good in both indoor and outdoor shots. This overlay #5 was taken from "Marvel Wings"
This wings Photoshop overlay is quite appropriate for creative shots taken at the nature background. It adds bright white butterfly wings with an elaborate wing pattern and increases the magnificence of a picture. Fairy Wing Overlay #6 "Little Elf"
For this wings overlay it is better not to choose a photo with a light or exposed background. This overlay #6 was taken from "Marvel Wings"
If you need to enhance an infant portrait and give it a magical vibe, apply the fairy wings overlay free. It adds white curved fairy wings, which will contribute to an overall enchanting atmosphere of the image. Free Wings Overlay #7 "Feathery and Light"
For this wing overlay pick up a photo where the model is located in the center of the image. This overlay #7 was taken from "Marvel Wings"
If a model in the photo is in active motion, apply the wings overlay Photoshop. It will add beautiful, white and transparent butterfly wings to a photo. Photoshop Wing Overlay #8 "Like a Moth"
Lifestyle, non-staged photos are exactly what you need for this wings overlay. This overlay #8 was taken from "Marvel Wings"
This wing overlay Photoshop is suitable for those shots where the back of the model is visible. The addition of butterfly wings with an exquisite wing ornament will significantly change the picture. The model doesn't need to face the camera. Photos taken from the back will also look great. This overlay #9 was taken from "Marvel Wings"
Any ordinary portrait can be brightened up with this wings Photoshop overlay. It adds white, delicate and transparent butterfly wings. Wings Overlay Photoshop #10 "Silvery"
Don't make the wings too big. They shouldn't be the center of attention, just complement the photo. This overlay #10 was taken from "Marvel Wings"
If you need to intensify the miraculous effect in the image, the wings overlay Photoshop will be the most fitting one. The application of wide, white and transparent butterfly wings will definitely leave every model, especially a young one, satisfied.